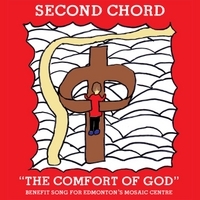 The song is an uplifting, reflective, spiritual song of thankfulness for God's love co-written and performed by grade 5 students from Edmonton Christian Northeast School as a fundraiser for Edmonton's Mosaic Centre. "The Comfort of God", inspired by 2 Corinthians 1:3,4, was written and performed by 27 grade 5 students, along with Paul Jensen (vocals, acoustic guitar), Natalie B (vocals), Joel Kleine (bass, electric guitars) and Dave Snaterse (drums). All profits from the sales of the song will go to Edmonton's Mosaic Centre; a non-profit wellness centre serving people challenged by poverty, hunger and homelessness in northeast Edmonton. The song is a reflective and uplifting reminder of God's love.